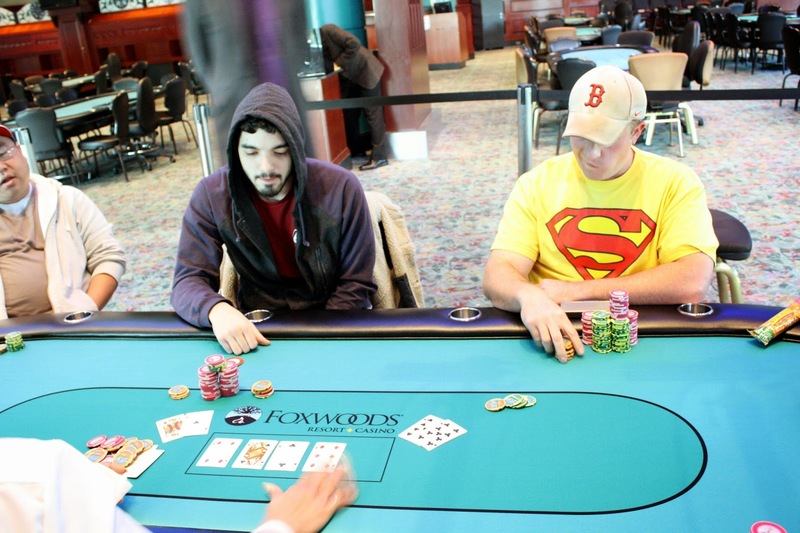 When Omar Saeed and Je Wook Oh got heads up, Omar had about a two to one chip leader. The two discussed a deal and negotiated a chop where Je Wook Oh would get $63,000 and Omar would get the rest. After running the math, Omar will take home $74,983 along with the title and the Mega Stack Challenge Main Event trophy. Congratulations, Omar! At 30,000/60,000 blinds, Aaron Smith openen on the button to 125,000. Je Wook Oh folded the small blind, and then Omar Saeed reraised to 400,000. Aaron responded with a 4-bet to 1,125,000, and Omar 5-bet shoved. Aaron called off with [8s][8h], but was in bad shape against Omar's [Ts][Td]. No eight appeared, and Omar will eliminate Aaron Smith in 3rd place. He will collect $34,003 for his efforts. The final three have taken their seats and are now playing 30,000/60,000 blinds with a 10,000 ante. On a [8s][3s][3d] flop, Je Wook Oh called Omar Saeed's 3-bet all in. Omar tabled [9s][9h] for an overpaid, but Je Wook had outflopped him with his [Qc][3c]. The [2c] on the turn changed nothing, and the [3h] on the river gave Je Wook quad treys to win the hand and double up. He now sits on 2.1 million while Omar drops to 1.8 million. On a [7s][8c][Td] flop, Aaron Smith was all in with [8s][8d] and was up against the [Js][Ts] of Omar Saeed. Omar had a gutshot, the [Tc] gave Aaron a full house, leaving Owen to need the [Th] or a jack to make a bigger full house. The [Qc] was not what Omar was looking for, and Aaron will double up to over 1.1 million. On a [2h][4d][2s][2d] board, Michael Dobbs was all in and was snap called by Omar Saeed. Michael had turned a full house with his [Tc][4h], but Michael had turned quad deuces with his [Ac][2c]. Michael was drawing dead, and the meaningless [9h] hit the river to send him to the rail in 9th place. He will earn $27,918 for his efforts. Under the gun, Je Wook Oh opened the pot before Omar Saeed 3-bet. 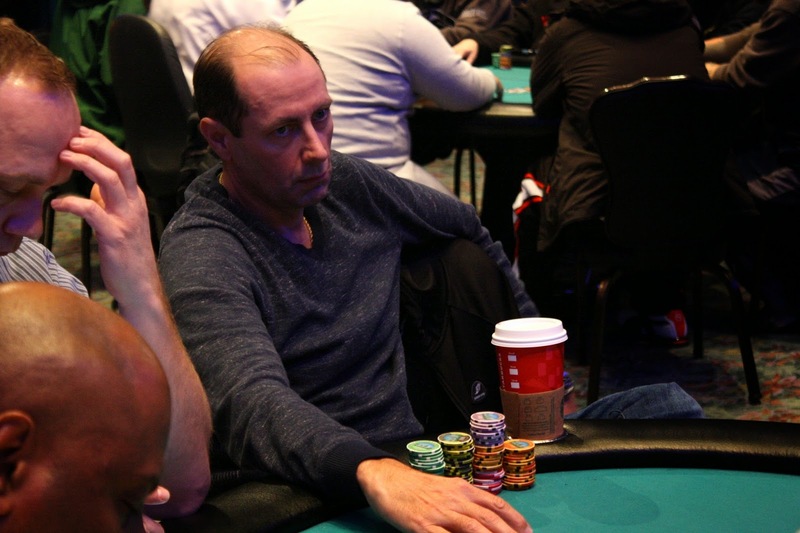 Michael Dobbs looked down at his cards and 4-bet all in. Je Wook got out of the way, and Omar called after some time in the tank, tabling [Ac][Th]. He had hoped it would be a race, but it was not as Michael had him dominated with [As][Ks]. The [3c][9c][9d] gave Omar some chop outs, but the [Ts] on the turn changed everything. Michael would need a king on the river to survive. Miraculously, he found it when the [Kh] hit the river. Michael will double up to over 800,000 while Omar is still sitting pretty with 1.55 million. The final 4 players are now on a 15 minute break. When they return, blinds will be 12,000/24,000 with a 4,000 ante. Steven Tabb has been eliminated when he ran his [Ad][Kh] into Je Wook Oh's [Ks][Kd]. The [4d][9s][8d] flop brought no ace, but the turn [Qd] did give Steven a flush draw. When the [Ts] hit on the river, Je Wook high-fived his rail and then congratulated Steven on his run. Steven will earn $21,118 for his 8th place finish. Souhka Kachittavong was all in preflop holding ace eight and was called by Michael Dobbs holding ace queen. The board ran out 6-4-4-3-J to send Souhka to the rail in 6th place. He will earn $16,823 for his efforts. Samuel Taylor was all in holding [Ac][Kd], and Aaron Smith was once again the player trying to score a knockout. Aaron held [9s][9c], and it was the best hand through the [4d][Qs][2c] flop and [6d] turn. Samuel snapped his fingers and called for a king to hit the river, but instead it was a [4c]. Samuel will collect $13,601 for his 7th place finish here today. 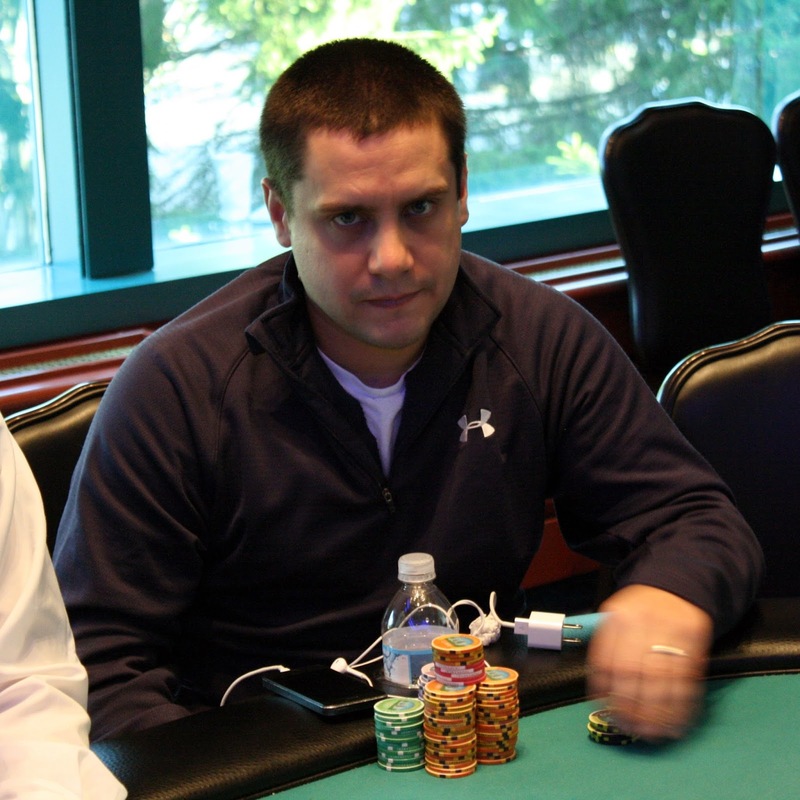 At 8,000/16,000 blinds, David Espinola was all in for his last 110,000 with [Ad][Qd] against Aaron Smith's [As][3s]. 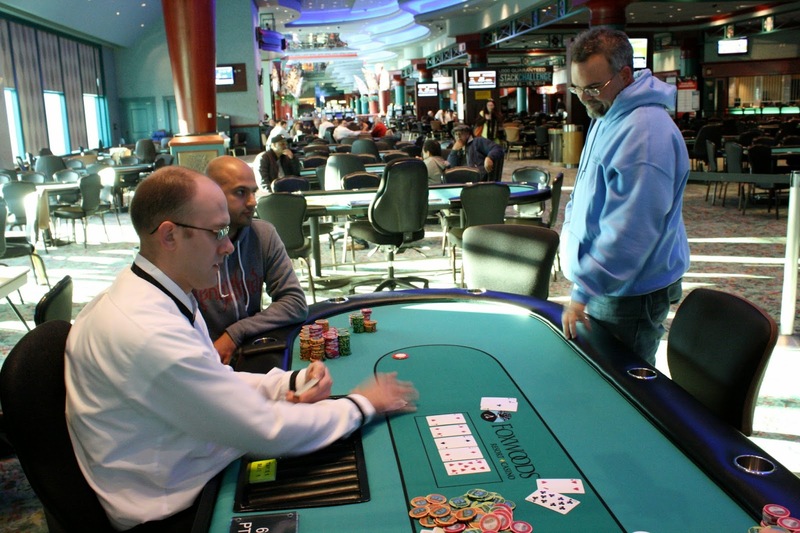 David was in great shape to double up after the [5c][5s][Ac] flop. The [2s] turn meant Aaron went from drawing dead on the flop to having a slew of win outs to go with his existing chop outs. Amazingly, the [Js] hit the river to gave Aaron the winning flush. David will exit this tournament in 8th place, good for $10,917. 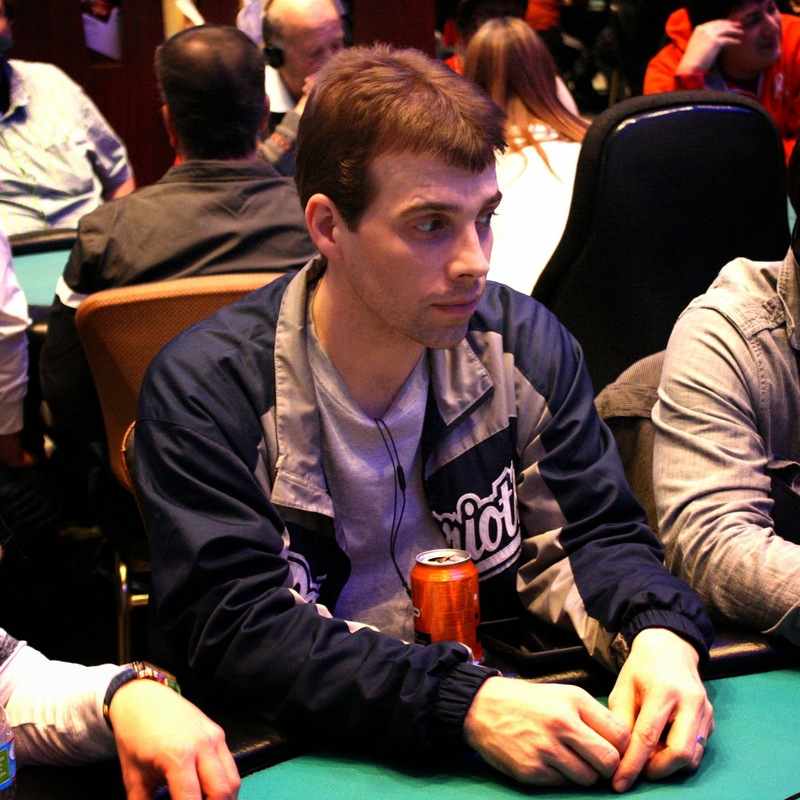 After being crippled on a previous hand, Joe Starratt was all in for a little more than the big blind. He was called by both Je Wook Oh in the small and and Steven Tabb in the big. The flop fell [8c][Qh][5h], and Je Wook check-called a bet from Steven. When the [5s], Je Wook checked again and Steven fired one more time. Je Wook laid down his hand, and Steven tabled [Js][5d] for trips. Joe was drawing dead with his [Ad][3c], and when the river landed the [6d], he was sent to the rail in 9th place. Joe will collect $8,597 for his efforts. 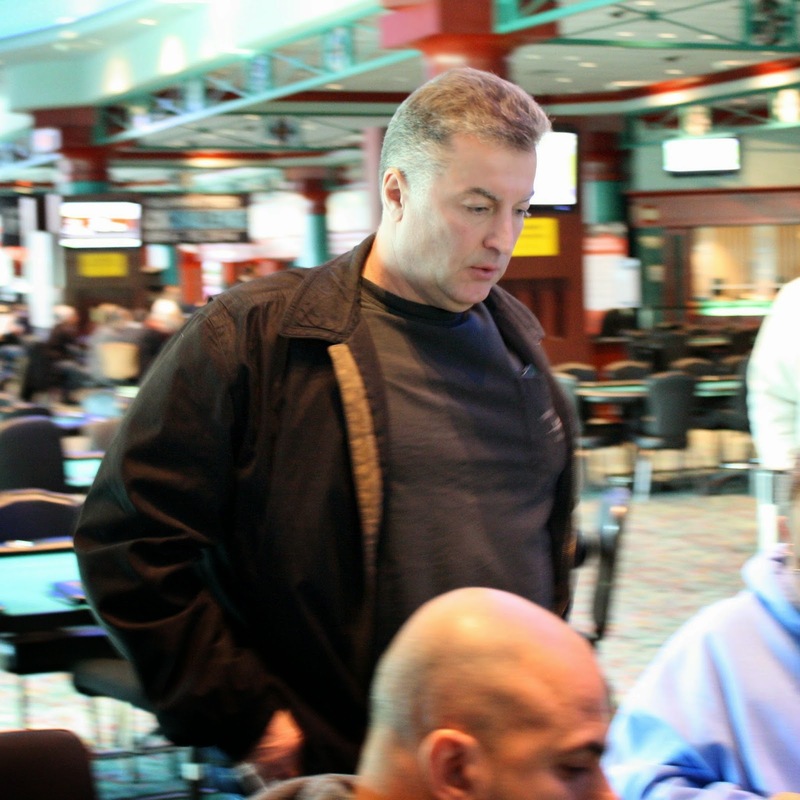 Roger Brestak has been eliminated in 10th place when his pocket queens ran into the [As][Ad] of Omar Saeed. 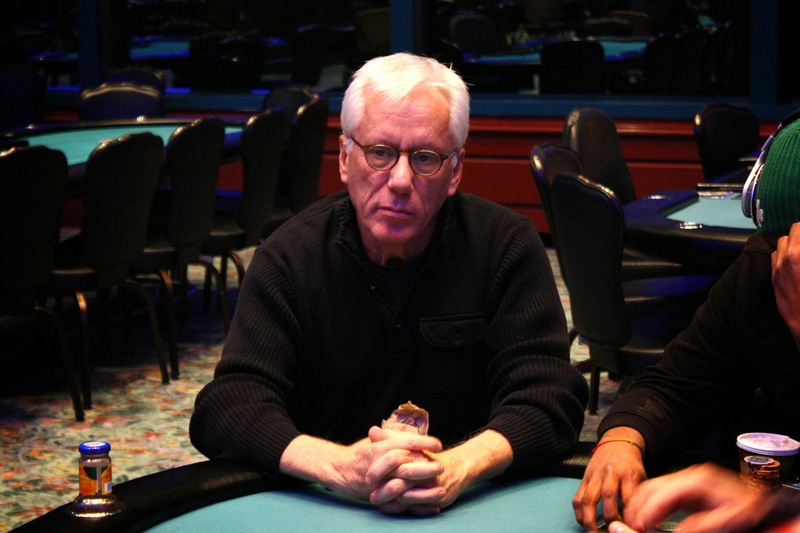 The board ran out [6c][8d][4c][2d][7d] to send Roger to the rail, collecting $6,064 for his efforts. 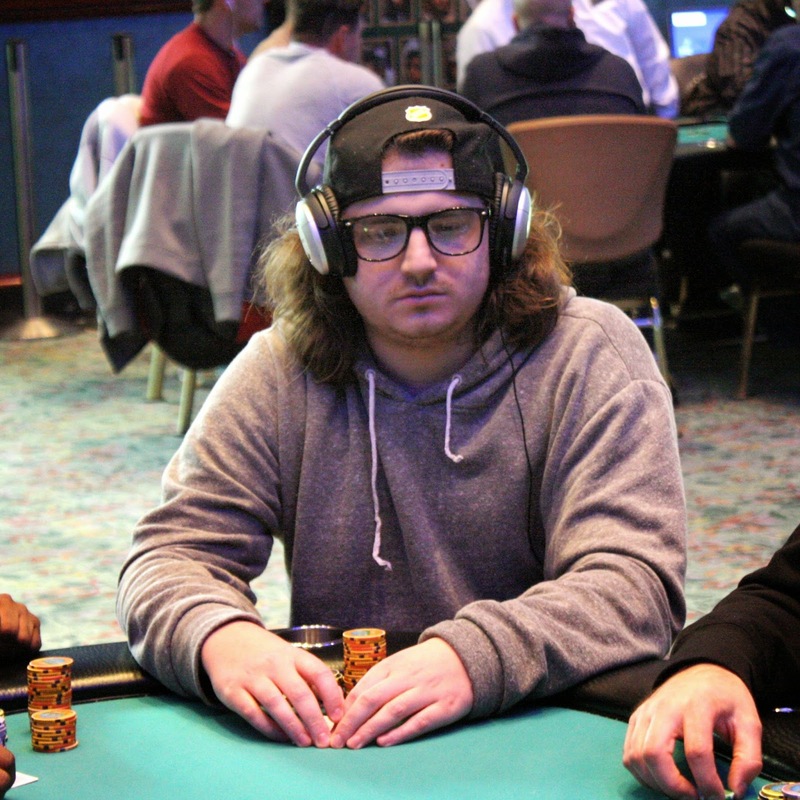 With the elimination of Joseph Tieri in 11th place, the final table has been reached in the $1,650 Main Event. Play will resume after a short break. Cards are in the air for Day 3 of the $1,650 Main Event. 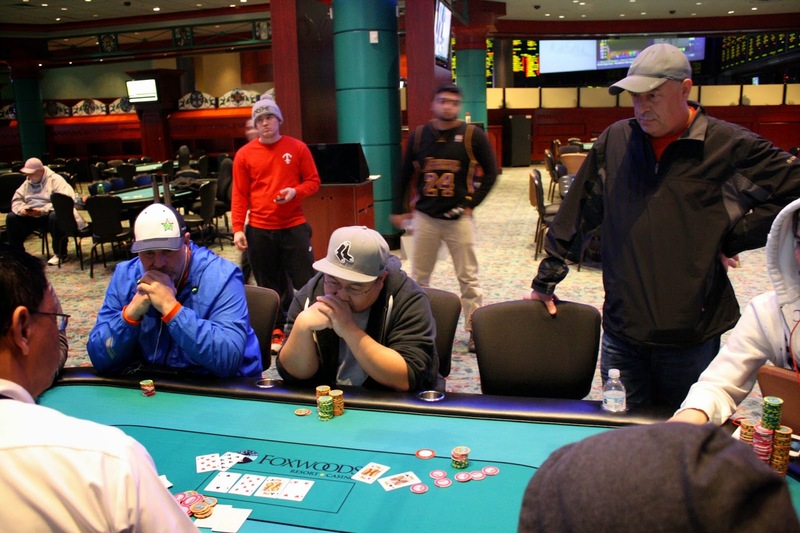 The final 11 players have taken their seats, and all eyes are on the $85,367 first place prize. 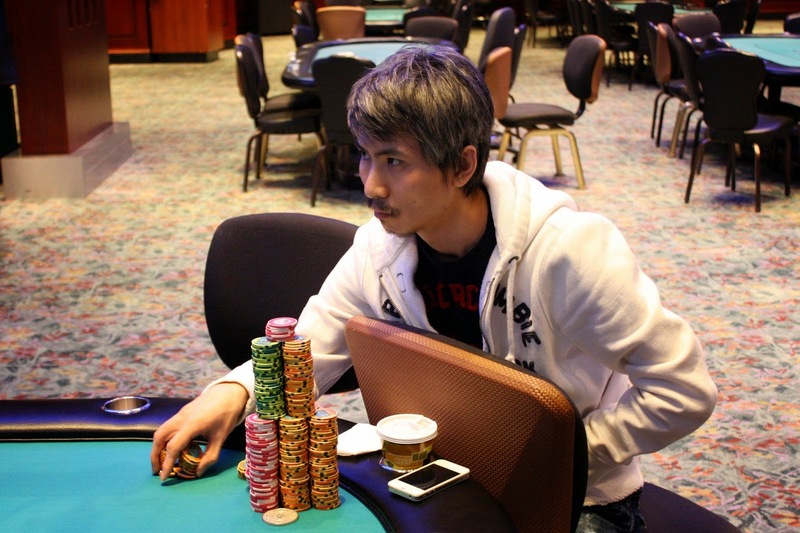 Je Wook Oh is the chip leader with 1,604,000, and Joe Starratt is the short stack with 92,000. Blinds are 8,000/16,000 with a 2,000 ante. You can watch all of the action unfold on our live stream at www.FoxwoodsLive.com. With 10 minutes left on the clock, a card has been drawn. The field will play four more hands before bagging up for the night. Currently, there are 11 players remaining, and the survivors will return tomorrow at 12pm EST for Day 3 of the $1,650 Main Event. Je Wook Oh seems to be in every hand at the featured table, and he recently had Shawn at risk with pocket fours against Je Wook's king queen. 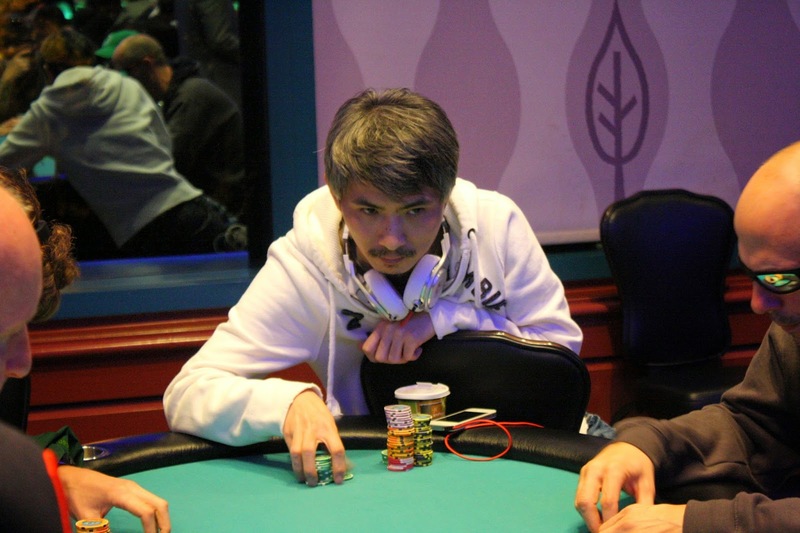 Je Wook flopped a pair, and it held to send Shawn to the rail in 12th place, good for $6,064. 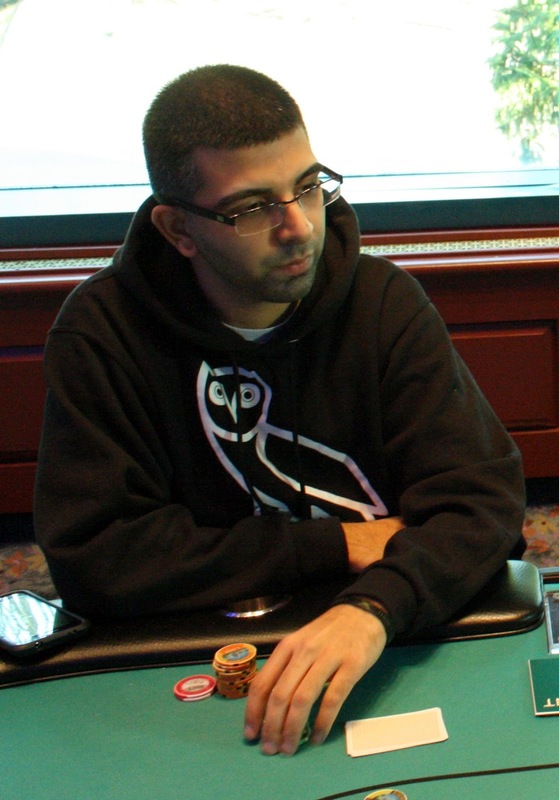 Ryan Methia has been eliminated in 18th place when his [8h][8c] ran into his opponent's [Ks][Kd]. It was a dramatic flop as it fell [2s][8d][Kc], giving both players a set. Ryan would need to hit the [8s] to survive. The [4h] fell on the turn, and the [3c] his the river. Ryan will earn $5,011 for his 18th place finish. 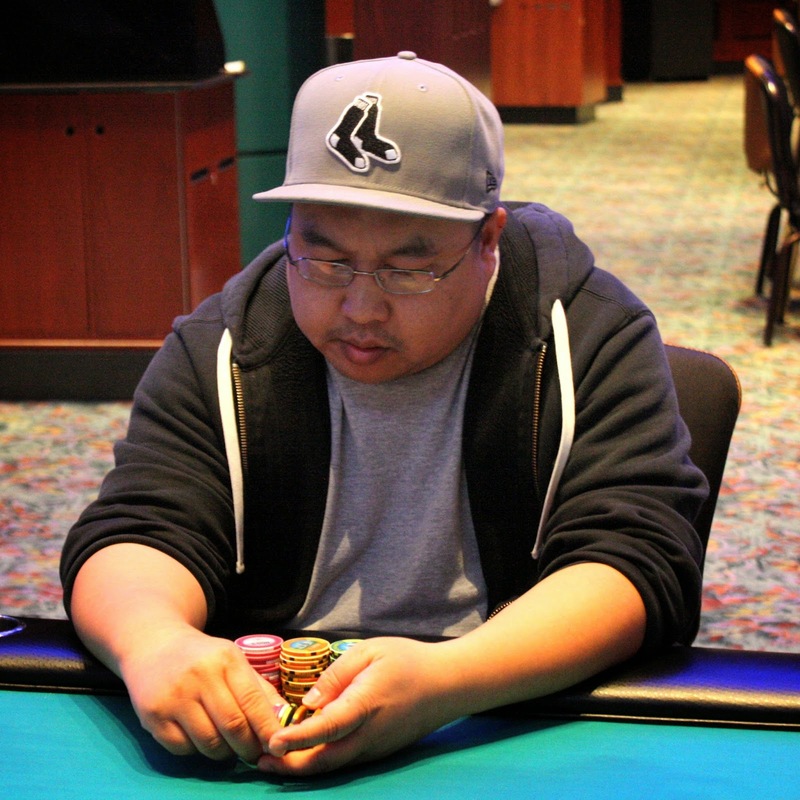 Je Wook Oh eliminated our 19th place finisher in dramatic fashion when his [Ks][Kh] rivered a king against Donald Yicius's [Ac][9c]. The [2d][Ad][4d] flop put Donald in the lead, and the [8h] turn changed nothing. But the [Kd] was the two outer Je Wook needed. He shot out of his seat in excitement, and Donald was sent to the rail in 19th place. The remaining 18 players are guaranteed a $5,011 pay day. Tournament staff are breaking the third table now, and there are still 17 minutes left at 4,000/8,000 blinds with a 1,000 ante. Everyone folded to Fred Paradis in the small blind, who pushed enough chips in to cover the big blind. The big blind instacalled, tabling [Ac][Jc] and was up against Fred's [Th][5h]. Joanna the dealer dealt the [3s][6c][Ts] flop, pairing Fred. The [5s] gave Fred an unbeatable two pair, and the meaningless [7h] meant the field was now in the money. 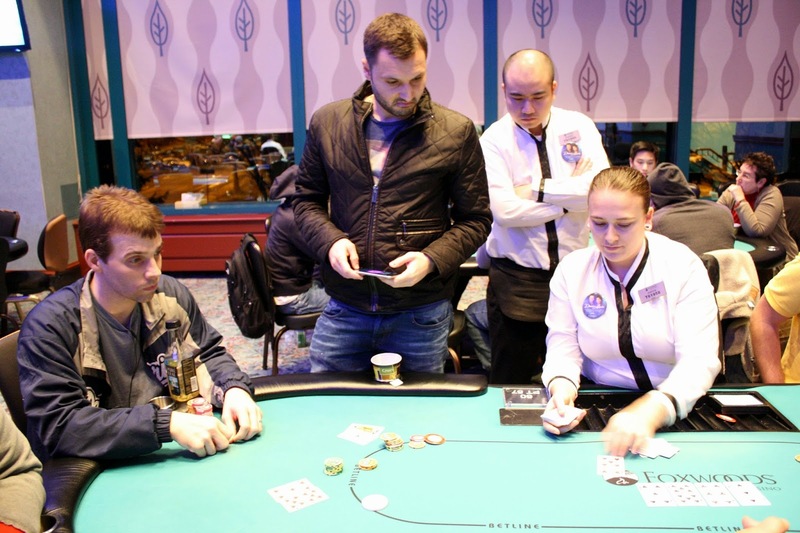 A player on another table went bust on the same hand, so the two players will split 27th place money, or roughly $1,789 each. It only took 14 minutes after from coming back from dinner break to go from 31 players remaining to 28 remaining. At the end of the current hand, play will be hand for hand. The next player to be eliminated will be the bubble boy. Dinner break is complete, and the final 31 players have taken their seats. Blinds are now 3,000/6,000 with a 1,000 ante. When the field reaches 28 players, play will go hand for hand. On the last hand before dinner break, a player in middle position opened to 10,500 at 2,500/5,000 blinds with a 500 ante. 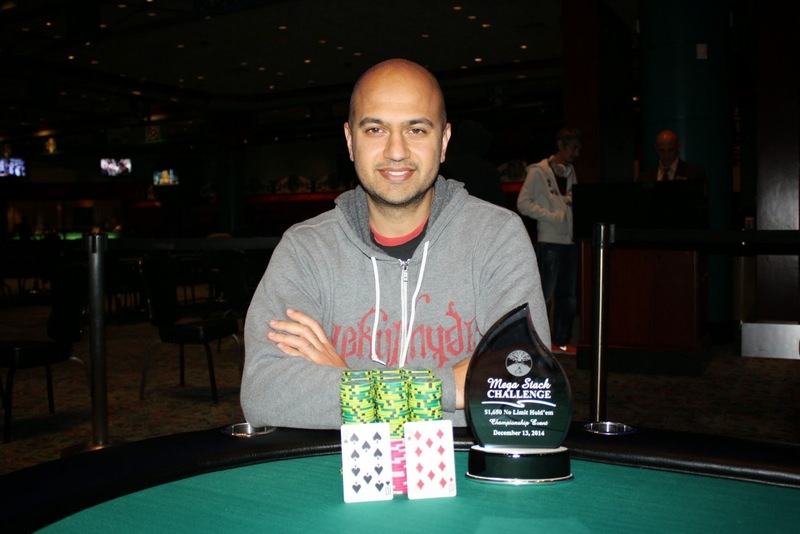 Tarun G. committed his last 50,000 chips from the small blind. As the dinner break begun, Tarun's opponent spent a long time in the tank, lasting around three to five minutes. He eventually made the call, and was ahead with his [5h][5c] against Tarun's [Ah][Th]. 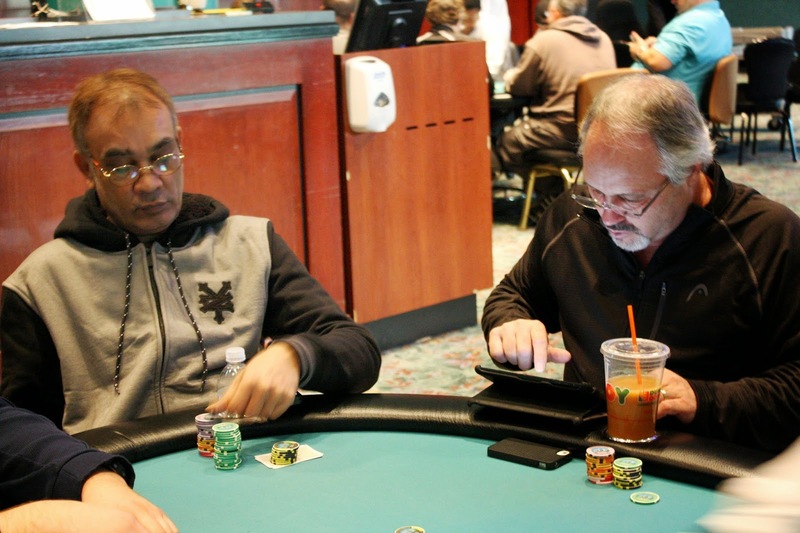 The [9s][7h][Qc] flop brought not help to Tarun, but the [Kd] gave him a gutshot to go with his two overcards. The [8h] changed nothing, however, sending Tarun to the rail in 31st place, only 4 spots shy of the money. The 31 remaining players are now on a one hour dinner break. Play will resume at approximately 7:30pm EST. 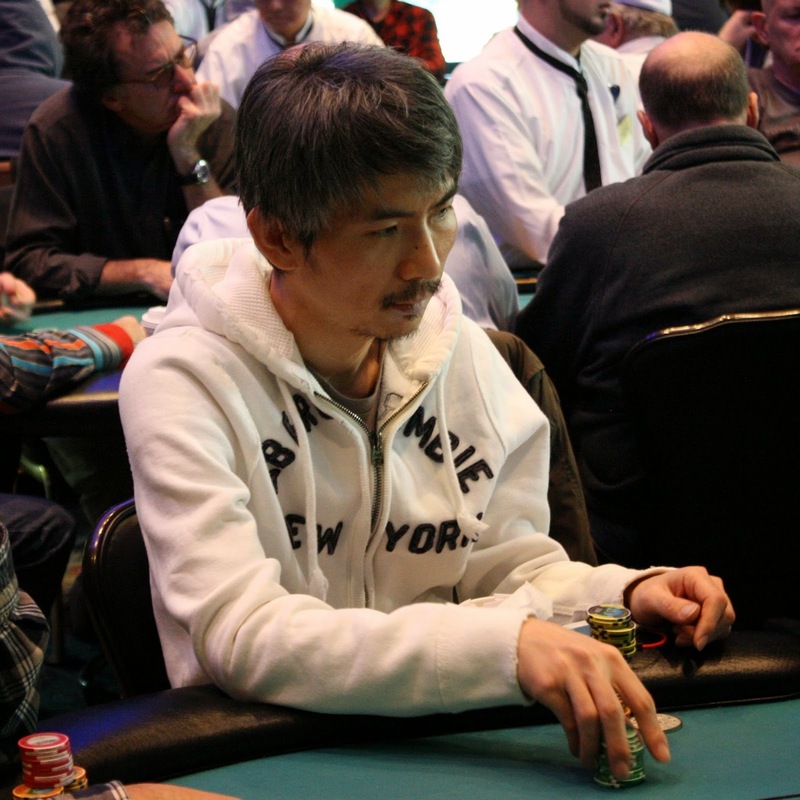 Je Wook Oh is doing well with over 500,000, while Fred Paradis is still nearing the top of the chip counts with 390,000. 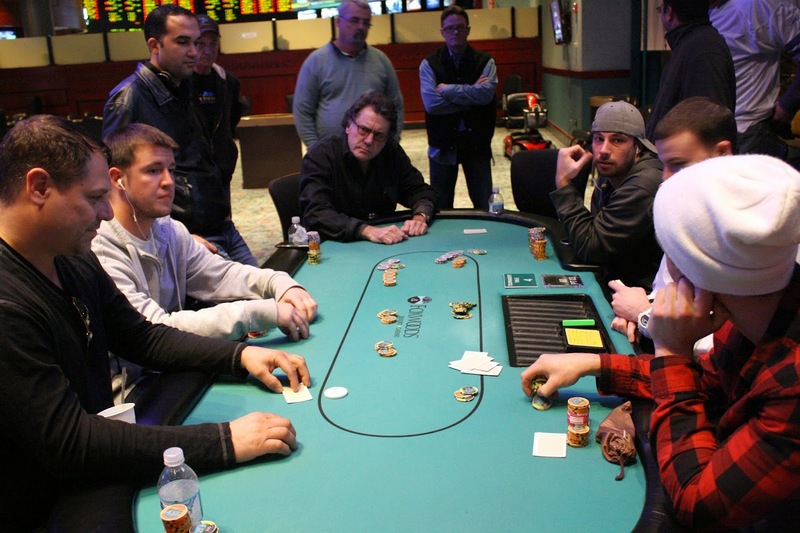 The final 45 players in the $1,650 Main Event are now on a 15 minute break. The tournament staff are coloring up and racing off the 100 chips. When they return, blinds will be 2,000/4,000 with a 500 ante. 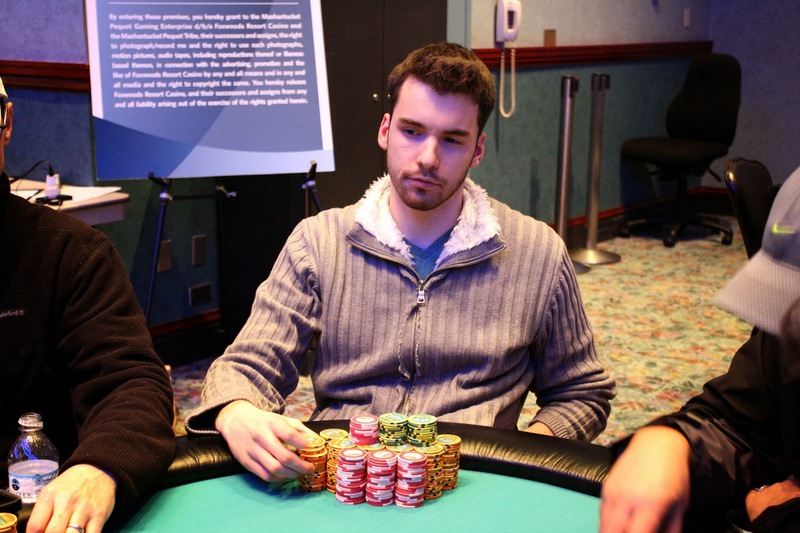 The river read [2c][Kh][9h][3h][Tc] and Fred Paradis bet 10,000 before his opponent raised to 30,000. Fred thought about the raise for quite some time, eventually electing to call for roughly 25% of his stack. His opponent showed [Ac][Jh] for a missed flush draw, and Fred tabled [Kc][Jc] for top pair. Fred's good call will put him over the 100,000 mark with 86 players remaining. Cards are in the air for Day 2 of $1,650 Main Event. 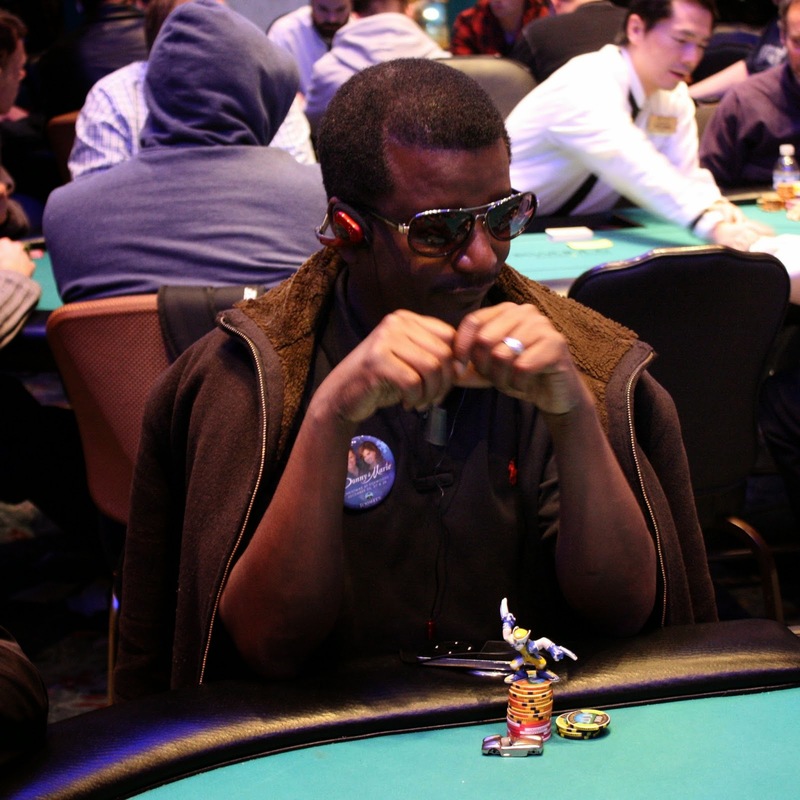 93 players remain from the both Flight A & B. Justin Adams is the chip leader with 248,200. With blinds at 800/1,600 with a 200 ante, Justin has 155 big blinds. Other notables still in the field with at least 100,000 are Stephen Dare, Christopher Leong, Jason Calnan, Fred Paradis, Andrew Lauer, Roland Israelashvili, Je Wook Oh, and Ryan Eriquezzo. 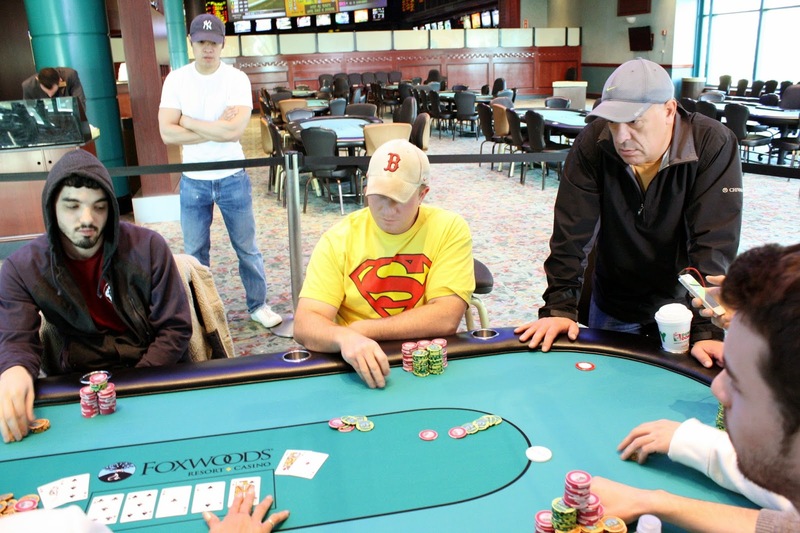 You can watch the live stream of the feature table at www.FoxwoodsLive.com. Cards are in the air for the final event of the December Mega Stack, Event #11 $300 NLH Big Stack. This event features 30,000 in starting chips and 20 minute levels for the first 25 levels, and then 30 minute levels. A full structure is available here. 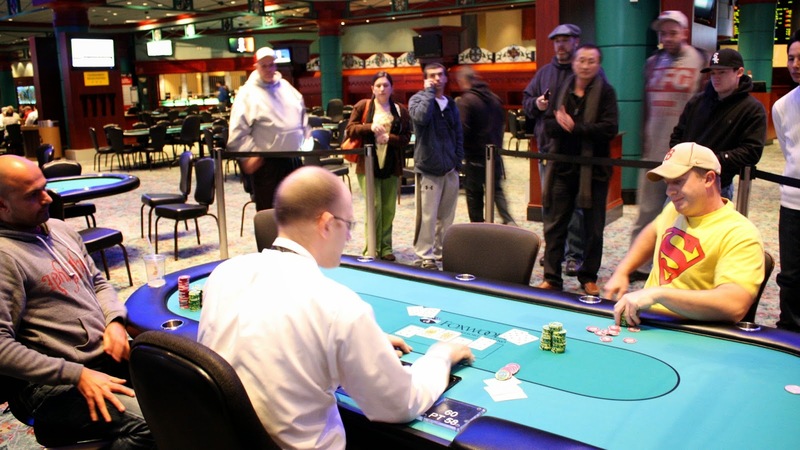 At 12pm, the $1,650 Main Event will resume with the final 93 players. 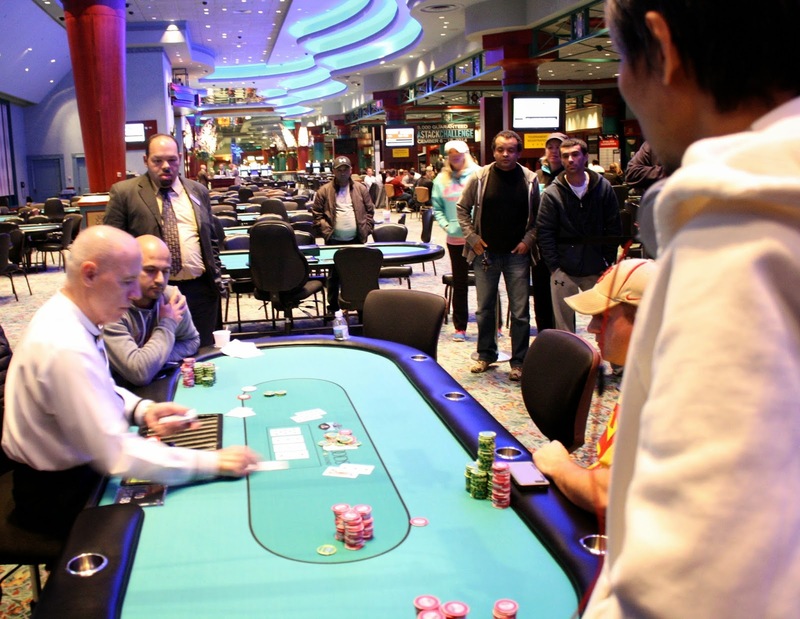 39 players remain from Flight B and they are now bagging up their chips for the night. They will combine with the remaining players from flight A tomorrow at 12pm. 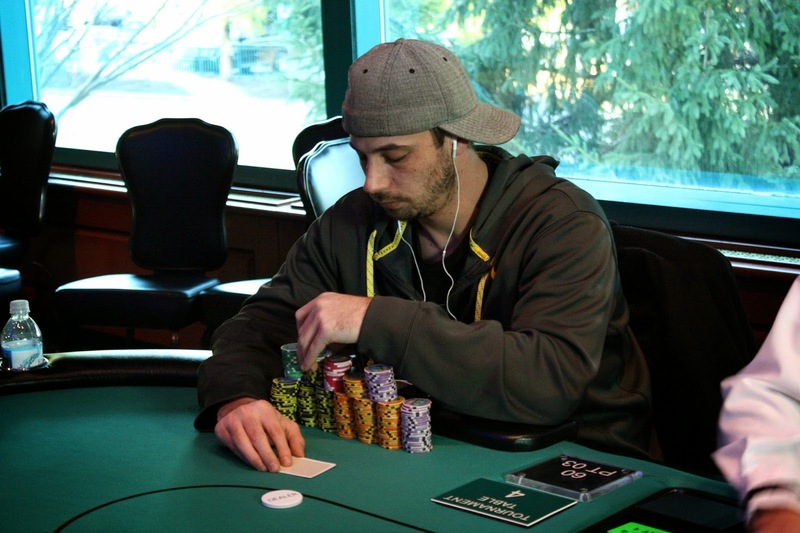 Both Kevin Calenzo and Dave Stefanski have both been eliminated Flight B only a level short of the end of day. Kevin took a bad beat, losing with [Ah][Kh] to his opponent's ace queen. 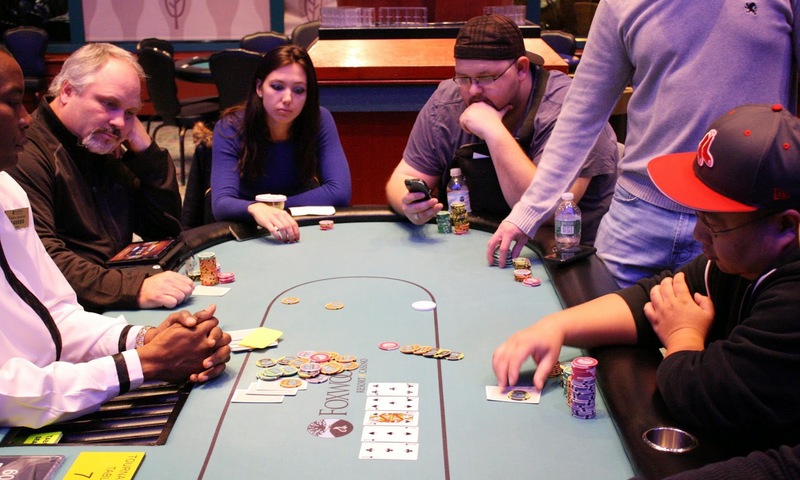 The flop fell with two queens, and though Kevin turned a flush draw, the river was a brick. Dave 3-bet shoved against a late position open holding ace jack, and he ran into his opponent's ace king. 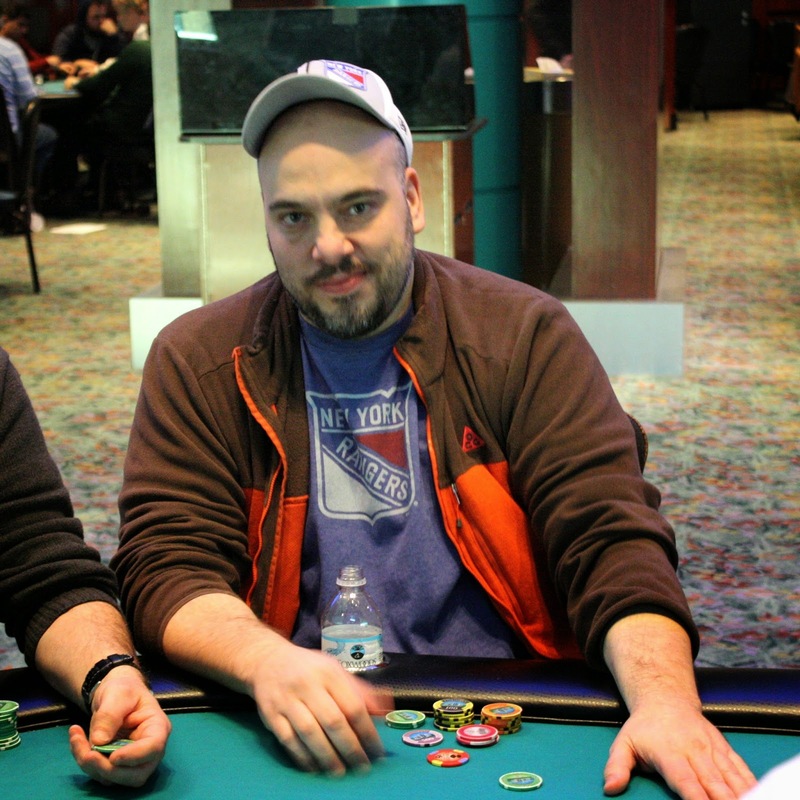 On a A-7-4-4 board, a player bet 12,000 before Andrew Lauer moved all in. His opponent called off pretty quickly, prompting Andrew to ask if he had ace king. Andrew tabled ace queen, which was ahead of his opponent's ace jack. A harmless ten hit the river to earn Andrew the KO and the pot. He now sits on 90,000. 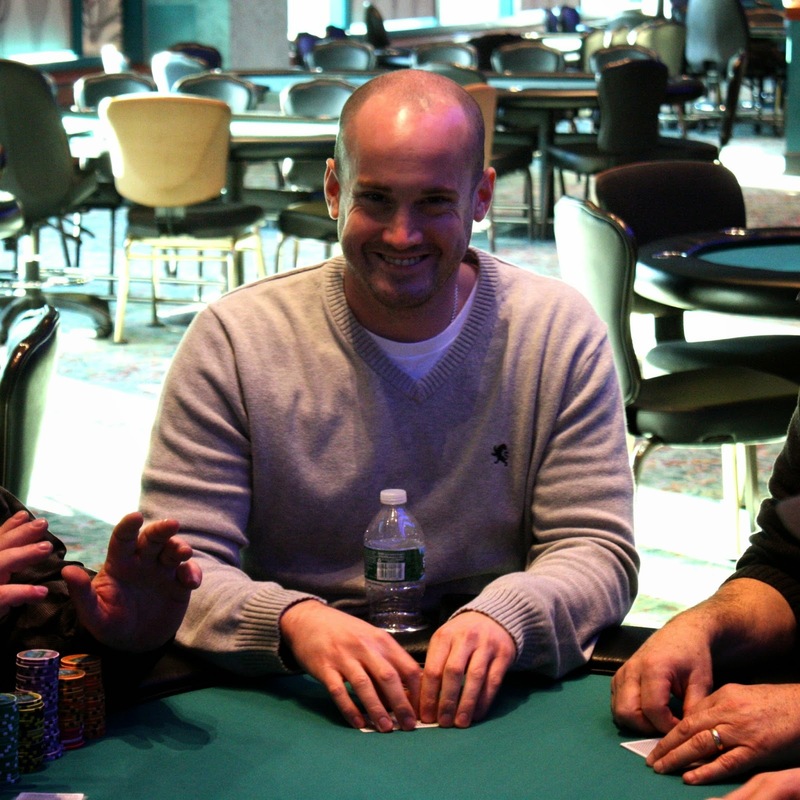 We caught up to see Mike Nye in late position, Kevin Calenzo on the button, and the small blind a [5c][5s][Qs] flop. The small blind checked to Mike who bet 2,500. Kevin called, and then the small blind check raised to 6,500. 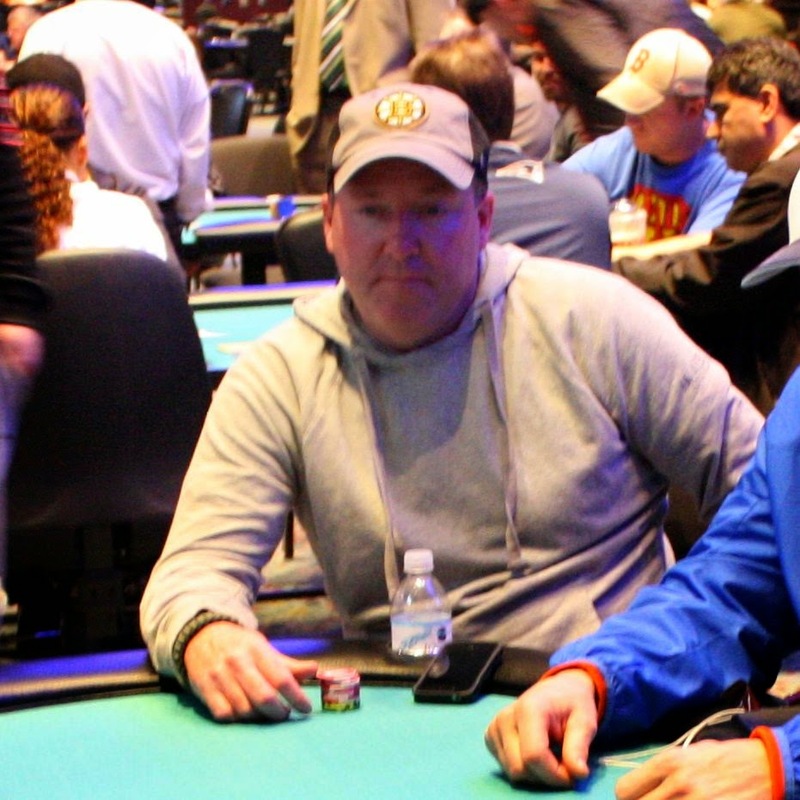 Mike made the call, and after a brief speech comparing himself to Phil Hellmuth, Kevin folded. The turn came the [3s], and both remaining players checked. 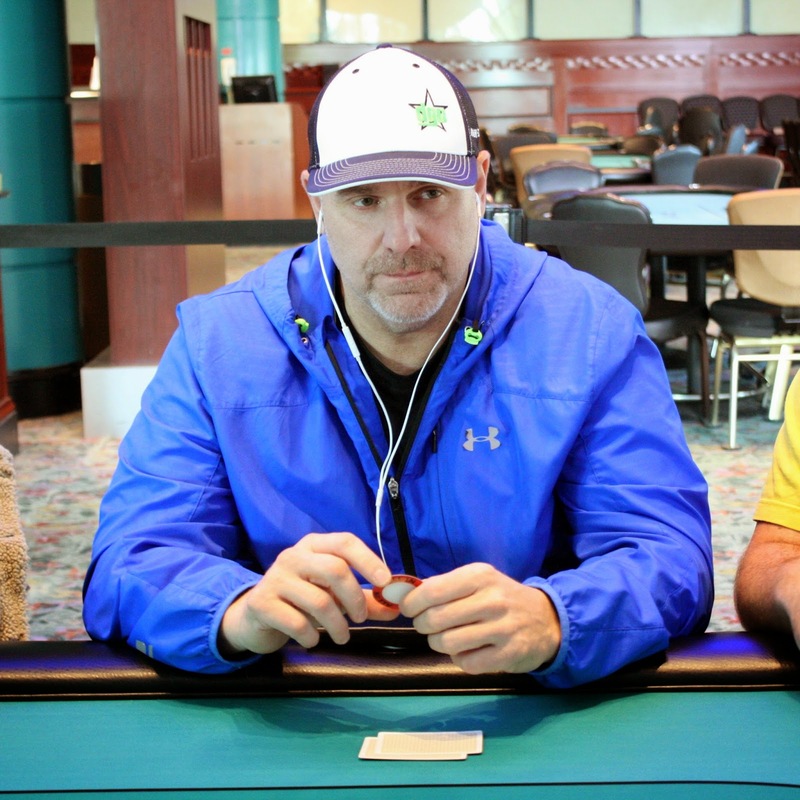 When the [3c] hit the river, the small blind bet 7,300 and Mike instantly threw in two 1,000 chips, signifying a call. The small blind tabled [Ah][Qh] for two pair, but Mike had a flush with his [8s][6s]. Mike will increase his stack to 85,000 after this hand. There are 97 players remaining in Flight B and they are now on break. When they return, blinds will be 200/400 with a 50 ante. In the last four hands of the night, we saw a crazy hand unfold at Ryan Eriquezzo's table. Three players limped in for 1,200 before the player on the button moved all in for 6,200. The small blind called, and then the Dan Burke, the first limper, re-raised all in for 19,200. The next limper called all in for less, and action was back on the third limper. The [4s][3c][5s] flop was rather uneventful, giving only the [Jc][5c] outs to beat the kings. The turn [3c] took away his jacks as an out, and the [6d] on the river meant Dan's pocket kings had held up in a huge pot. He will score a double knockout, and earn himself a ticket to Day 2 unless he gets really unlucky in the next three hands. With 10 minutes left on the clock, a card has been drawn. The field will play four more hands before bagging up for the night. Players will return tomorrow at 12pm EST to combine with the remaining players from Flight B. The blinds are now 600/1,200 with a 200 ante in Flight A, and this will be the last level of the night. There are currently 66 players remaining from the flight's 131 entrants. Meanwhile, Flight B is on their first break of the day. There are currently 72 entrants in that flight, and registration is still open. 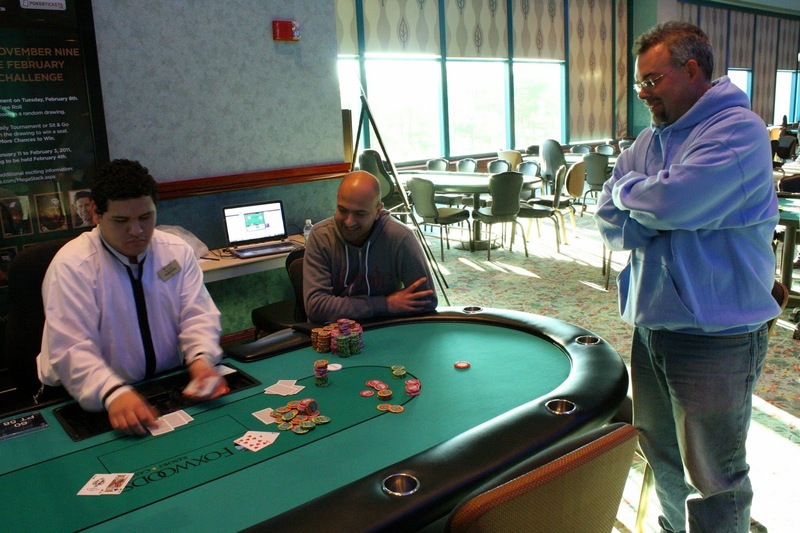 Kevin Calenzo was about to leave the tournament area, thinking break had begun. But the dealer had already cut the cards and was dealing one last hand. Kevin saw the [6c][7s][6d] flop along with two other players. Steve Centamore led out from the small blind for 2,200 and a player in mid position called. Kevin raised to 6,200 on the button, leaving 7,575 behind. Steve called, and the other player folded. The [3c] hit the turn, prompting Steve to move all in. Kevin said he was drawing dead if his opponent had a full house, but he ended up committing his chips anyways. Steve tabled [5s][4c] for a turned straight, and Kevin had all the outs he had hoped for with his [9c][8c]. The [Js] river meant Kevin had missed his flush and straight draw, and he will be eliminated from this flight. We noticed Tarun G. standing up away from the tournament area. As it turns out, he was just eliminated when his pocket queens lost to his opponent's ace king. Tarun is currently considering buying into Flight B. Cards are in the air for Flight B of $1,650 NLH Main Event. Registration is open for the first 8 levels.